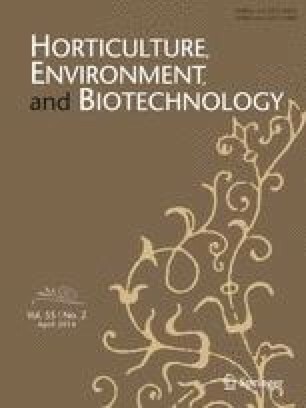 Vegetative growth traits, and fruit yield and quality of ‘Synda’ tomato plants were compared with those grafted onto ‘King Kong’ rootstock or self-grafted. All experimental plants were trained to have either one stem (single stemmed) or two stems (double stemmed). Values of stem diameter, leaf area, leaf and root fresh weight (FW), and root dry matter (DM) increased with grafting onto ‘King Kong’. Stem length, stem and root FW, and stem DM in double stemmed plants increased. Mean fruit weight, number of fruits, and yield were significantly increased by 11, 17.8, and 27%, respectively, in the grafted plants. Number of fruits and fruit yield increased, while mean fruit weight decreased by 12%, in double stemmed plants. Contents of total soluble solids (TSS) and vitamin C increased in the fruits harvested from the grafted plants. Grafted and double stemmed plants resulted in significant increase in dry matter allocation to different tomato organs.